For 66 years, the Fred Hall Shows have been designed to provide families with a full day’s worth of outdoor recreation entertainment. And for 2012 — at the Fred Hall Long Beach Show — there is more to see and do than ever before. There is much to see and do here, for every member of the family. You won’t want to miss this year’s Field Time Sports and Guns Speed Shooting Show; performances by Jack Dagger, the King of Fling; the amazing Dodge Dock Dogs; the AAA Kids Fish Free Trout Pond; the Great American Duck Races; or demonstrations by Scott Leysath, the Sporting Chef at the Costa Sunglasses Sporting Chef Cafe. What would a sportfishing show be without fish? You’ll find them — at the Seeker Rods Saltwater Tank and World Fishing Network’s Freshwater Tank — and you can get ready for them at the Giant Casting Arena and the Mammoth Lakes Fly Fishing Ponds. There’s also an area where you can learn to scuba dive right on the show floor. In addition, there are archery ranges and three shooting ranges. 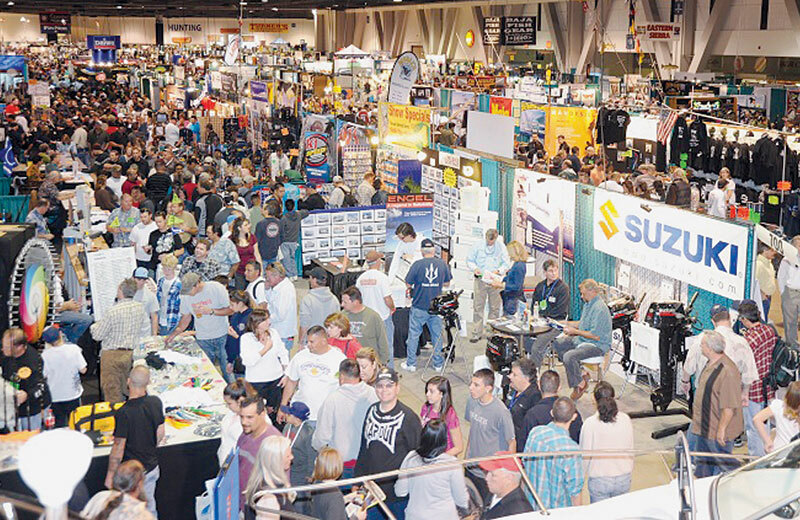 At the show’s main venue — the Long Beach Convention Center — show-goers looking to expand their sportfishing skills and knowledge can take part in their choice of nearly 400 seminars, where question-and-answer sessions are a big part of the program. One of the main seminar areas is presented by Mammoth Lakes, California. Shimano will also present seminars in its expanded booth, and Berkley will feature a full seminar schedule at its booth. Two special pre-show seminars are planned this year — and tickets for each one can only be purchased online, at fredhall.com. Berkley will present “All Things Saltwater Bass: A Special Pre-Show Workshop” from 11:30 a.m.-1 p.m. March 8. The workshop will give anglers a rare opportunity to learn from some of the most talented tournament bass anglers fishing the SWBA circuit — including Capt. Jimmy Decker, Tracy Viloria, Randy Spizer, Justin Reynolds, Afran Abutin and Erik Landesfeind. Find out their secrets to consistently catch more fish and bigger fish, regardless of your current level of experience. The cost is $25 per person, which includes admission to the show — and only 150 tickets will be available for online purchase. Shimano will present “Long-Range Fishing in Detail: A Pre-Show Fishing Workshop” from 11:30 a.m.-1 p.m. March 9. The workshop will feature legendary long-range sportfishing captains Frank LoPreste (Royal Polaris), Tim Ekstrom (Royal Star) and Roy Rose (Royal Polaris). Whether you are a seasoned long-range angler or have just been thinking about making your first trip, this special session is a rare opportunity to gain years of useful information and insight while others are waiting in line waiting for the show to open at 1 p.m. Tickets — including show admission — are $25 per person, available online only. Seating is limited. There will be many opportunities to win prizes at this year’s Fred Hall Long Beach Show — and you’ll find special show pricing on items at many of the show’s more than 800 booths.